When Harry Met Sally. You know you love it! As far as chick-flicks or rom-coms go, this is one of the classics. And one of my personal favorites since it has a riduculous amount of food references strewn throughout. But, if you know that it was written by Nora Ephron, that probably doesn't come as a surprise to you. Ephron was a foodie (whether that's a term she used or made jokes about, I can't be sure). Have you read Heartburn? I Feel Bad About My Neck? Crazy Salad? 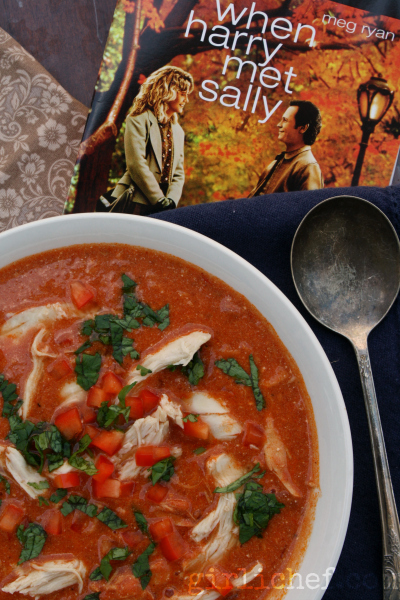 Food played a prominent role in Ephron's life. Must be one of the reasons that I can relate to her words so well. So, back to When Harry Met Sally. From Chef's Salad and Apple Pie a la Mode (special order or off-the-menu) at the diner that Harry and Sally stop at shortly after they first meet to Bloody Mary's on a plane to hot dog carts and Chinese Restaurants..from dinner parties to wedding appetizers to grilled radicchio and chocolate mousse pie. From Coconut Cake with Chocolate Sauce on the side to the infamous diner scene ("I'll have what she's having"). And from Salmon with Mustard Sauce ("Well, I just want it the way I want it.") to goofy talk of Chicken Paprikash and Pecan Pie. There is no shortage of inspiration to glean from this flick! I went back and forth on what I wanted to make, but in the end, I went with a spin on Chicken Paprikash. In the form of soup. I used smoked paprika and smoked sea salt, which lent a deep...well...smoky (duh)....flavor to the dish. I found it utterly addictive. And I ate it for every meal that followed until it was all gone. 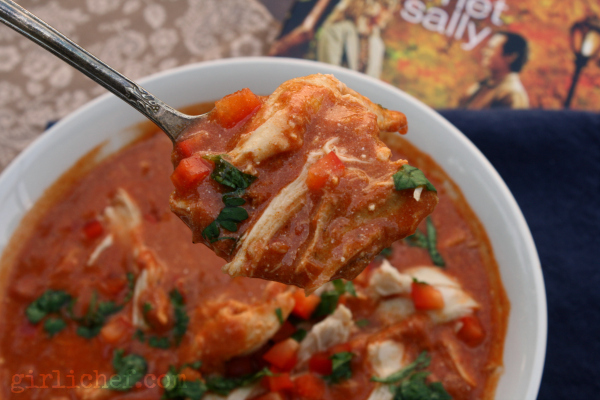 This spin on chicken paprikash in the form of soup gets a deep, smoky flavor from the addition of smoked paprika. 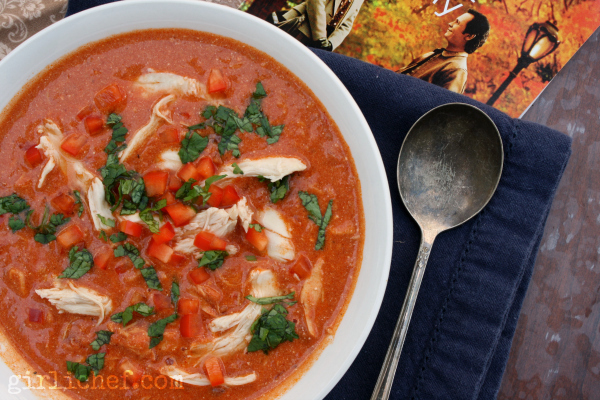 Melt the butter in a medium-sized Dutch oven or soup pot over medium heat. Add smoked paprika and onion and cook, stirring occasionally, for 3 minutes. Sprinkle the flour in and continue to cook and stir for another 2 minutes. Stir in tomatoes and bring to a simmer, ~2 minutes. Add broth, cover and reduce heat to a simmer for 10 minutes. Add bell pepper and cook another 5 minutes. Whisk in the sour cream, a little bit at a time until it is all incorporated, and then stir in the chicken; cook for a couple of minutes until everything is heated through. Add a teaspoon of smoked sea salt and a few good grates of black pepper; taste, and adjust as needed. 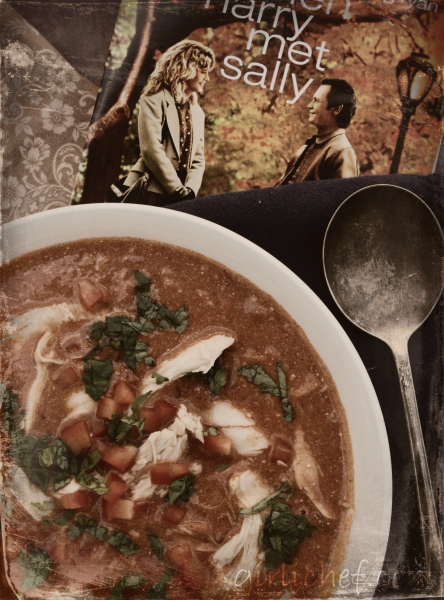 This month's edition of Food 'n Flix is being hosted by Caroline of Caroline Makes, with her pick, When Harry Met Sally. Submissions are due on August 28th, so you still have time to join us this month, if you want to (and why wouldn't you!? )...take a little time to (re-)watch this flick and find your inspiration before heading into the kitchen. We'd love to have you join us! And if you'd like to join us next month, we'll be heading over to This Mama Cooks! to watch her pick, Toast. I'm also sending this bowl of soup over to Deb at Kahakai Kitchen for this week's Souper Sunday roundup!